An association of 5,000 academics on Monday became the largest U.S. scholarly organization ever to join the boycott of Israeli academic institutions. The American Studies Association, which calls itself "the nation’s oldest and largest association devoted to the interdisciplinary study of American culture and history," announced Monday that its membership passed a resolution stipulating the organization "endorses and will honor the call of Palestinian civil society for a boycott of Israeli academic institutions." The resolution, which was introduced last year and unanimously endorsed by the ASA's national council on November 4th, attracted an unprecedented number of voters, with 66.05% endorsing the resolution, 30.5% against, and 3.43% abstaining, according to the ASA statement. "The overwhelming majority that voted in favor of the resolution illustrate that we refuse to lend complicity to Israel's aggression," Steven Salaita, associate professor of English at Virginia Tech and a member of the ASA Activism Caucus, told Common Dreams. "This stance in solidarity with Palestinian freedom is historic and signals a new era of engagement with colonized populations." The resolution passed with an outpouring of support from ASA members, including renowned activist, author, and scholar Angela Davis. "The similarities between historical Jim Crow practices and contemporary regimes of segregation in Occupied Palestine make this resolution an ethical imperative for the ASA," she wrote. "If we have learned the most important lesson promulgated by Dr. Martin Luther King—that justice is always indivisible—it should be clear that a mass movement in solidarity with Palestinian freedom is long overdue." The ASA has faced an onslaught of criticisms and attacks from pro-Israel forces, including calls from former Harvard president and Obama administration official Larry Summers for a boycott of the ASA on grounds that the resolution violates academic freedom and perpetuates anti-Semitism. Academic freedom means very little when it takes place in a context of segregation and apartheid. Change came to the Jim Crow South not through academic dialogue, but through protest and, in some cases, through boycotts of the institutions that fostered segregation. Change came to South Africa’s apartheid system not through academic dialogue, but through protest, resistance, and an international boycott. Those of us who value academic freedom must always struggle to ensure that the world surrounding academia provides the basic human rights that enable academic life. "The boycott resolution is intended to address a profound case of discrimination against Palestinians and is consistent with the ASA’s previous endorsement of anti-racist positions in other areas," Lubin stated upon endorsing the resolution. "The resolution does not target Israelis, Jews, or any individuals; indeed, the ASA’s support for the boycott affirms its opposition to all forms of racial discrimination, including, but not limited to, anti-Semitism and Islamophobia." The call for boycott, divestment, and sanctions against Israel emerged from Palestinian civil socieity organizations in 2005 in a bid to win human rights, self-determination, and freedom from occupation for Palestinians, using tactics similar to those levied to transform apartheid South Africa. Days ago, in a letter of support to the ASA, the University of Hawaii Ethnic Studies department became the first academic department in the west to support the academic boycott of Israel. In April, the Association for Asian-American Studies endorsed the academic boycott—the first professional academic association in the United States to do so. Around the same time, the Teachers’ Union of Ireland unanimously called on its members to “cease all cultural and academic collaboration” with the “apartheid state of Israel,” and the Federation of French-Speaking Belgian Students (FEF), representing 100,000 members, adopted “a freeze of all academic partnerships with Israeli academic institutions.” Also this year, student councils at several North American universities, including at the University of California Berkeley, called for divestment from companies profiting from Israel’s occupation. It is resolved that the American Studies Association (ASA) endorses and will honor the call of Palestinian civil society for a boycott of Israeli academic institutions. It is also resolved that the ASA supports the protected rights of students and scholars everywhere to engage in research and public speaking about Israel-Palestine and in support of the boycott, divestment, and sanctions (BDS) movement. 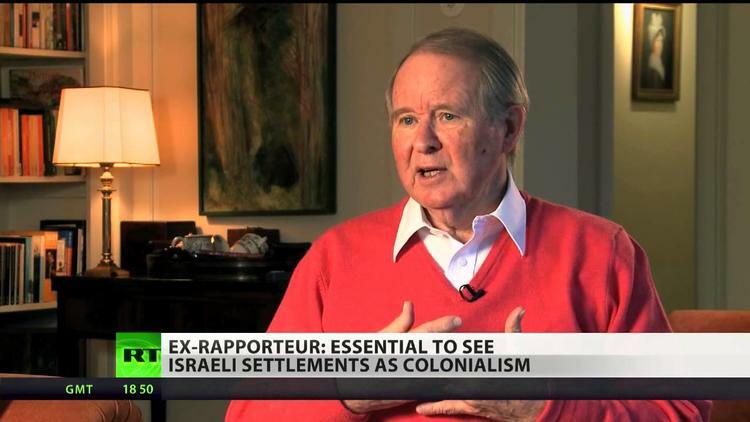 RT talks to South African academic and activist John Dugard, former special rapporteur to the UN Human Rights Council concerning Palestinian affairs about the resemblance to Apartheid of Israeli rule of the Palestinian West Bank.